MURFREESBORO, TN — The way MTSU student Damarcus Seaberry sees it, part of Dr. Martin Luther King’s legacy is embodied in Seaberry’s very presence on the Blue Raider campus — a young African-American male pursuing his dream of one day becoming an athletic director. The Covington, Tennessee, resident also recalled the lessons his grandmother taught him to show “genuine” love to everyone, a message that King gave his life to promote by leading the nonviolent movement that changed a nation by forcing it to honor its founding ideals and stop treating black Americans as second-class citizens. 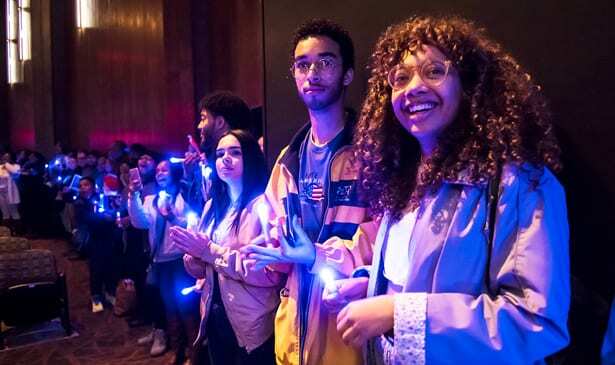 Seaberry was among a diverse crowd of roughly 250 attendees, including MTSU President Sidney A. McPhee, at the Monday night (Jan. 15) university-sponsored celebration and candlelight vigil inside Tucker Theatre in observance of the federal holiday in honor of the slain civil rights leader. Hosted by Alpha Phi Alpha fraternity (of which King was a member), the event was highlighted by featured speaker Phil Darius Wallace, an actor and writer from Memphis, the city where King would be struck down by a sniper’s bullet on the balcony of the Lorraine Motel 50 years ago during his visit in support of a sanitation workers’ strike there. Known for his one-man shows about the lives of King, Malcolm X and Frederick Douglass, Wallace took the audience on a journey through critical turning points in King’s life — becoming an ordained minister at age 19; leading the 381-day, Rosa Parks-inspired Montgomery Bus Boycott; giving the prescient “Mountaintop” speech in Memphis the night before his death. Wallace even added a sampling of the contrasting, biting rhetoric from fellow civil rights activist Malcolm X, who was assassinated three years before King and who, despite public tensions between them throughout their parallel social justice journeys, was someone who King had hoped to work with before he was struck down. Brian Marshall, historian for the local Alpha Phi Alpha chapter, opened the event by telling the audience that American society would indeed one day reach King’s “promised land.” MTSU junior Ontario McGregor, president of the Alpha Phi Alpha’s Kappa Xi chapter on campus, introduced a brief film segment about King’s involvement with and induction into the nation’s first intercollegiate black fraternity and how it shaped his life of leadership. 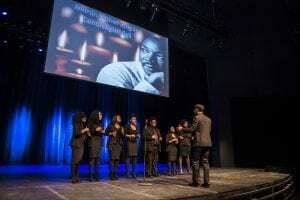 Also performing at the event was MTSU’s Generation of Purpose gospel choir and Chandler Custer, a student at Austin Peay State University, who performed a violin tribute to King and his widow, the late Coretta Scott King. Before offering a closing prayer and leading the crowd in reciting the True Blue Pledge, Dakota Logan, a pastor with the Point College Ministry of New Vision Baptist Church, challenged those in attendance to break out of their comfort zones moving forward and seek relationships with those of different races and cultures. Logan, who is white and an MTSU alumnus, recalled his days as a student just a few years ago in which the social groups he observed in dining halls and other venues were too often not reflective of the overall diversity of the university. He noted that while “there are too many voices that fan the flame of hatred and division … and too many voices that remain silent when there is injustice,” King was among the few voices able to break through and that we all should follow his example. “What now for you?” he asked the audience. “We have a beautifully diverse campus. … Most of our friend groups aren’t as beautifully diverse. Monday’s event was sponsored by the MTSU Office of Intercultural and Diversity Affairs and the Center for Student Involvement and Leadership.